Headphones are a hardware that lets you listen to whatever you want, without disturbing your surroundings. If they come with a closed back feature, then you can secretly listen to everything without even being noticed. It never lets the sound playing in your head draining out. Moreover, nobody purchases headphones every day because there are several dollars involved. Everyone wants to grab something reliable, handy and easy to use with convenient features at a moderate price. Are you bored by seeing newer brands launching their ordinary products every day? Then try out Sony’s MDR-V6 Headphones. Sony is one of the companies with hundreds of satisfied customers around the world. 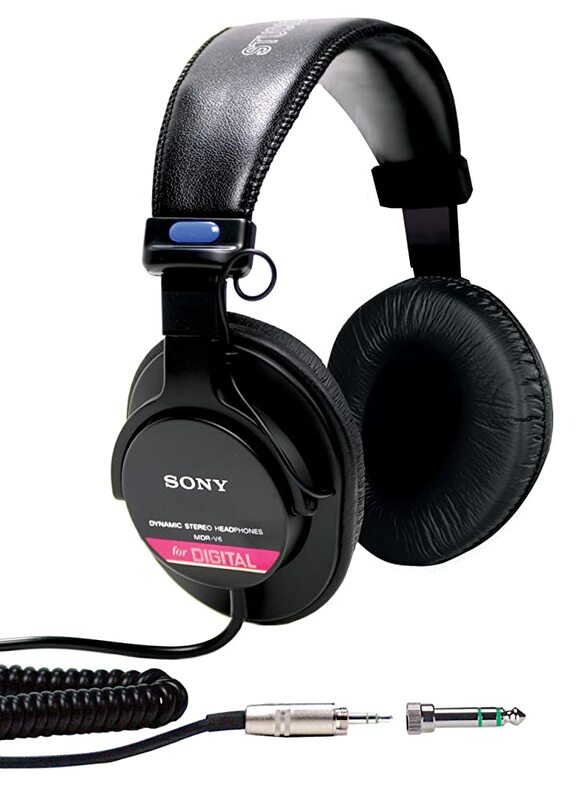 The Sony MDR-V6 Studio Monitor Headphones have been launched a long time ago. Then why on earth am I writing a review now, right? Well, I am doing this because the Sony MDR-V6 Headphones have not lost its demand on earth. They still are a great choice and are selling up till now. Due to its durability and trust of customers, I decided to provide an honest review for this product. With legit pros and cons, you can decide whether to buy the Sony MDR-V6 Studio Monitor Headphones (affiliate link) or not. Disclosure: Some of the links on this page are affiliate links, meaning, at no additional cost to you, I may earn a commission if you click through and make a purchase. The MDR-V6 are professional headphones by Sony. They make and provide durable and also reliable technology-driven products since ages. The MDR-V6 first launched in 1985 and became popular with sound engineers and DJs. Since then they upgraded the MDR-V6 many times to meet the needs of modern consumers. It has 40 mm drivers to produce an acute sound, no matter how loud or silent the volume is. The design is stylish as well as comforting. It lets you play loud music till hours, without giving rashes on your ears. The ear-cups are remove- and replaceable. Without wasting your time, let’s move on to the features, honest and legit facts of the Sony MDR-V6 Studio Monitor Headphones (affiliate link). The design consists of a plastic headband and metal earcups embedded with comfortable fluffy covering. Making it relaxing for the ears, head and the sides of the head. With only 0.66lbs in weight, this sleek and stylish headphone lets you keep it on for many hours. Moreover, its ear cups are remove-, replace- and adjustable. Meaning if one side of the headphone stops working, you have no need to buy new headphones. In fact, for less than ten dollars, you can get a new pair of ear cups. All you need is to adjust it on the headband and start enjoying your favorite music once again. What a cost-effective solution! Let us see at the inner anatomy of the MDR-V6 Headphones. We find 40 mm drivers and 63-ohm impedance to produce a pleasant sound. The neodymium magnets let you listen to the sound of each instrument playing. This is one of the reasons why most professional music makers prefer to use the Sony MDR-V6 Studio Monitor Headphones. They come with a 3m coiled copper-clad aluminum wire and a 3.55mm jack at the end plus a 6mm adapter. Because it is attached to the left ear pad permanently, a little too much tension could damage it. The MDR-V6 are best used with computers and sound making machines but can also be used with portable devices such as mobile phones. ANC and ANR stand for Active Noise Control and Active Noise Reduction. Respectively, this technology helps to reduce the noise of your surroundings. Also, it never lets the voices inside the headphones come out. Imagine you are on a busy road with lots of traffic. You hear a lot of noise of horns and the continuously chanting people around you. Then the ANC and ANR technology come in hand. It will let you experience the best music without disturbance. Also, if you don’t want others to know what you are listening to, then it will help to keep your music inside, just to you and no one else. You do not need to get a separate amplifier along with the MDR-V6 headphones. Because of its 3.55mm (1/4 inch) jack and the low ohm impedance, you can just plug it into your device and adjust the volume. Most headphones don’t come with amps and you have to buy a separate one. No more inconvenience with MDR-V6 Studio Monitor Headphones (affiliate link). Well, the price of the MDR-V6 Headphones is very low compared to other devices available. Along with a good and valuable price, Sony also provides a 90 days’ warranty claim. If you find any problem in the working of these headphones, you will get new ones completely free of cost. But, the problem should not have been occurred due to any outer influence. This way, the warranty is not supported. Nevertheless, it happens in very rare cases. Do you want to get your hands on a piece of hardware from an experienced company? Do you care about durable quality? Is a huge percentage of positive customer reviews a good sign to you? I can honestly say the MDR-V6 Studio Monitor Headphones (affiliate link) are one of the best available on the market. The latest version is upgraded and has all the features of modern headphones. If you are endlessly in love with music, then for home experience, the MDR-V6 Studio Monitor Headphones by Sony, will satisfy you. Keep in mind that most of the links used in this review post are affiliate links. This means that I may get a commission from Amazon. You will not pay more when buying a product through my links. However, this does not impact the reviews. I try my best to keep things fair and balanced, in order to help you make the best choice for you.